Combing back through that novel-in-progress–trimming, saving, adding–general revising. Here’s one of the early chapters. [Remember, this is a work of original fiction and is not intended to represent anyone living or dead. It it a figment of the author’s imagination. Borrowing or making your own is strictly prohibited. Thanks for your understanding]. Enjoy! “I married Joe for several reasons. One, he asked me. Two, he had good genes. And perhaps three, I was in love. With a mass of coiled PhD brains in his head, I knew he’d pass on intelligence, a trait 86% of the population finds valuable, along with a sense of humor, creativity, and problem-solving ability. I was torn. I wanted Steve go away, but I also wanted him to show up again. In reality, he had. He left a bit of himself behind, a trace. Actually, it was a crumb. A Dorito that attracted a colony of ants. My girls screamed when they found it on the front stoop and came running to me in the backyard where I was preparing the flower beds for winter. Digging up and dumping plants that wouldn’t survive, covering the furniture with tarps. Setting down my trowel and brushing my soiled hands down the front of my jeans, I made my way to the front of the house where I saw the pile of ants covering the orange crumb beneath the movement of tiny black bodies. I could barely make out the chip anymore. I picked up the bug infested Dorito, tossed it into the trashcan and smothered it with Raid. It was an unusually warm fall and I felt sort of guilty for taking away the ant’s food source. They, too were probably gearing up for winter, hoping to take it back to their ant friends in the colony so they could munch on it for months to come. But could it be that it was also a source of food for me? Food for the thoughts he consumed, nibbling at my essence and eating my conscience? Did that make me his food? He got into his shiny SUV and started it with a click before disappearing with a nearly silent purr. It was big change from the car we used to make-out in, a red Cavalier that started with a rumble that never ended because of an old muffler. 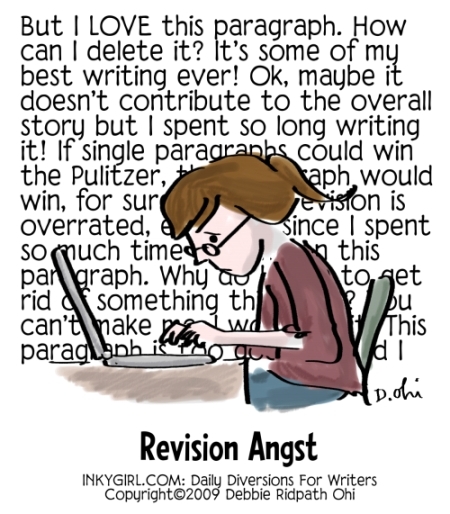 I certainly know about revision angst. Although, it does make me wonder about the gradations between “beige prose” and “purple prose”. In other words, prose that is bland, flat and not very exciting verses prose that is far too…I suppose the word would have to be “Flowery”. Funny you mention the colors. One of my main characters has grapheme synehthesia…she sees words as colors. Hoping all my prose is purple and not beige!